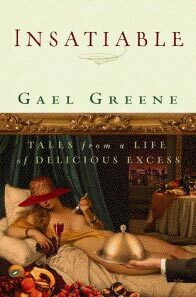 Okay, last summer while I was on the beach in Lake Tahoe devouring Gael Greene’s Insatiable—Tales from a Life of Delicious Excess, I was trying not to be totally jealous of this woman’s remarkable story as the burgeoning food critic at New York magazine in the 1970s. This tell-all novel was a rollicking good ride through some of the most seminal restaurants in recent culinary history. Plus she was one hell of a frisky lady, bedding her share of chefs and stars (uh, yes, Elvis) and going out dancing in the discos until all hours trying to burn off her nouvelle cuisine feasts. My kind of chick. She got to hang with the best of them, from Julia to James Beard to Jean Troisgros, from Balthazar to Le Bernardin. This book is a full-tilt feast, and poses some wonderful arguments in the perennial which is better?/food vs. s*x argument.